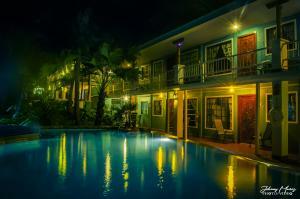 ﻿ Best Price on Ecohotel Arboleda in Quepos + Reviews! This Manuel Antonio Ecohotel Arboleda is 0.9 mi from Playa Espadilla and Manuel Antonio National Park. Features include an outdoor pool, restaurant, and free WiFi. A garden view can be enjoyed from each room. Ecohotel Arboleda extras include an en suite, tiled floor, and small seating area. Guests can relax on the terrace surrounding by the tropical landscape and grill meals at the barbecue facilities. A tour desk and shops are on site for added convenience. When not bird or monkey-watching on site, guests can venture 2 minutes’ drive to the Quepos Life Tourist information Cente. Juan Santamaría International Airport is 42 mi away.